I was reading Threads of Mine blog this morning. Besides showing off a darling hat and onesie for her granddaughter, Ruthie talked about how much lint her thread was leaving in her machine. Which brings me to the question . . . how do you evaluate thread lint? Ruthie mentioned it had been 2 weeks since she had cleaned her bobbin area and decided she didn't like the thread she was using because of excess linting. 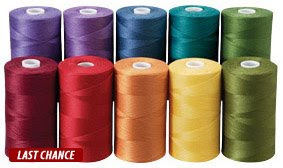 She uses Essential thread from Connecting Thread. Essential Threads is what I use most often and I like it. I don't find it lints all that much. It is reasonably priced and is extra long staple, Egyptian cotton. So, I go back to the question -- how to determine linting. I keep a little paint brush next to my machines. So, every time I change bobbins I give a little swish and swirl in the bobbin area. Every once in a while I take the bobbin mechanism apart, really clean out the lint and oil it. I also pop off the needle plate to clean it and wipe down the needle shank. Has anyone done a time sewn versus amount of lint produced evaluation? I'm thinking I should probably do one, but how is the question. So quilters, what do you think of this methodology? Starting with a clean machine, sew for 2 hours. Take pictures of the lint gathering places -- bobbin, under needle plate and needle shank. Continuing sewing and take more pictures after 4 and 6 total hours. Try it with a couple of different threads. Make sure the bobbin and the top thread are the same. I feel a Lint Bowl Challenge coming on. I challenge all of my readers to evaluate their thread using the methodology listed above. And, report back so we can share the information. (you can email me at brsinstitches@gmail.com) or add a comment to this post. Let me know what you think of my Lint Bowl Challenge? And, more importantly, report back in with your Lint Bowl Challenge results. A bad needle will make thread lint too. You should always change your needle after each project. Those threads look yummy. I think as others have said that link is not just from the thread. I mostly get lint while machine quilting so that is basically from the exposed batting. I wonder how many people are aware of the needle causing the lint. I think a lint bowl challenge sounds like a great idea and I do just love the selection and price of Essentials Threads. I love Jen's quilt and please say CONGRATULATIONS to her from me.